Been away for a few weeks focusing on other tasks. 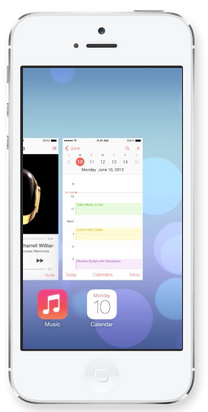 What better way to jump back into the Studio than with the shiny new iOS 7 straight from day one at WWDC. Admittedly I missed the keynote, but I have all the goods you need to know right here. Enough with the rumors, which I have been studiously avoiding over the past few months, let’s get down to brass facts. There are a lot of changes – Apple clearly is interested in keeping people interested in their devices, which is no surprise given the mounting consumer interest in Android software and hardware. The first thing you will notice when you get to load up the shiny new OS is the new look. 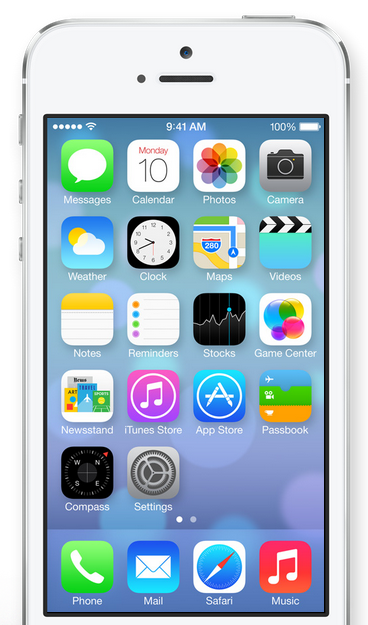 It’s called flat design and it quite literally takes the 3D out of the icons, pages and apps. But pretty is as pretty does, right? 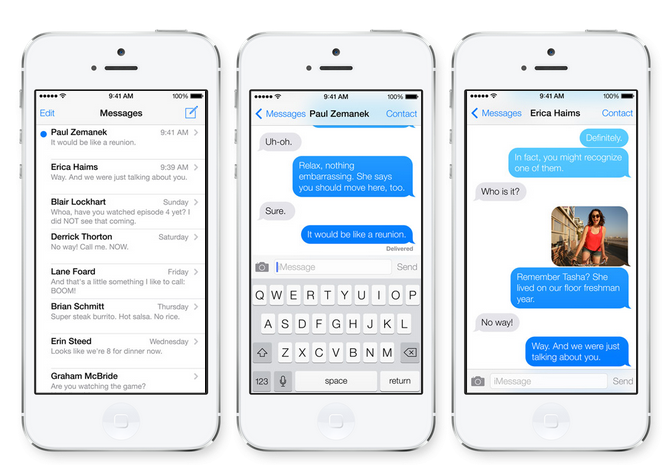 What will iOS 7 do? 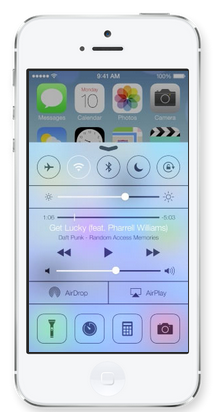 Control Center: Control Center is an overlay screen that offers quick access to your most used controls and apps. Swiping up from any screen, even the Lock screen, will get you into Airplane mode, Wi-Fi on or off, screen brightness, and even a flashlight. There goes my Flashlight app. 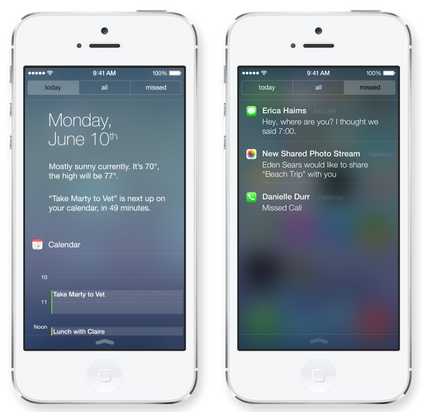 Notification Center: Beefed up and more usable – Notification Center gives you alerts for mail, missed calls, still to-dos, and more. “Today” is new and provides a summary of the days’ important features, such as weather, birthdays, traffic, etc., with a nod to tomorrow’s events. Looks a bit like Google Now in aspect. Swipe down from any screen, as usual. Multitasking: It’s gotten smarter. App updates happen automatically now in a strong Wi-Fi signal without battery drain. It will learn when you like to use what app and update the app before your usual use. Access preview screens of open apps and flick them closed (Hello Android and WebOS). Imitation is the highest form of flattery after all, and these are undoubtedly nice adds to iPhone / iPad / Touch users. Camera & Photos: Some tweaks and nods to Instagram, with square format options and filters. Plus easy access to still shots, video and panorama shots. Fun. 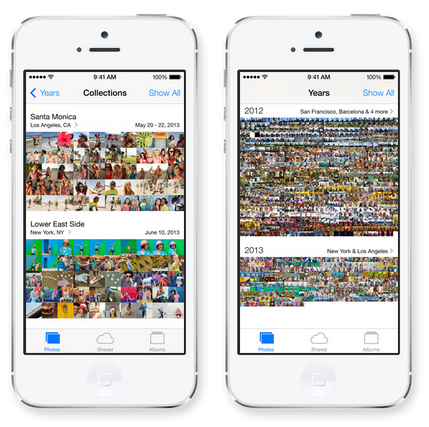 The Photo app also has some upgrades – Collections, Moments and Years. Photos will be automatically slotted into these categories to make for a bit better organization of those sometimes vast libraries. AirDrop: This has been available on Macs but it has now made its even more useful entre onto iOS. 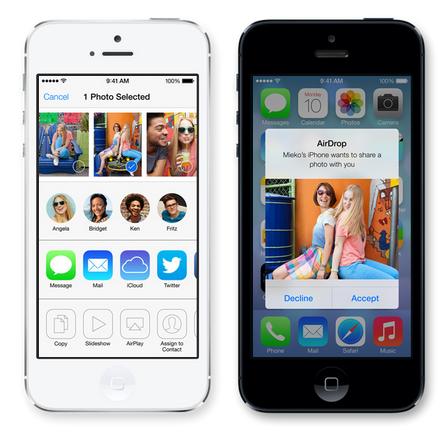 AirDrop is a sharing tool – quickly and easily share photos, videos, contacts — and anything else from any app with a Share button. Tap Share, select the person you want to share with and BAM – using Wi-Fi and Bluetooth, the media is transferred. Transfers are encrypted too, which is nice. iPhone 5 and later iPad and Touch versions only. 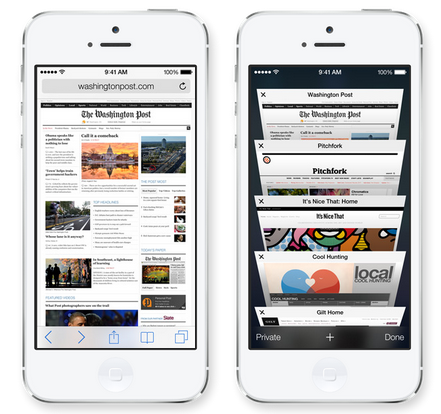 Safari: Much better than before and finally catching up to some of the other decent mobile browsers. Unified search / address box. Nicely executed visual tabs – think overhead Coverflow view. Full screen so you can take full advantage of those tiny screens. Swiping allows you to quickly move forwards or backwards through pages. Improved interfaces with Reader and Twitter. And a password storage keychain for Safari via iCloud. Or have Safari generate passwords for you. Finally up to 21st Century standards. iTunes Radio: Seems strange that the pioneer of digital media retailing took this long to develop its own radio streaming app, but here it is. 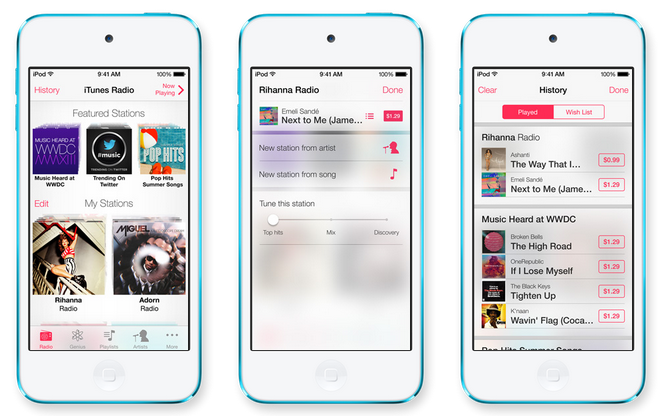 It’s not really radio reinvented as Apple proudly claims – its a lot like other streaming radio apps that allow you to build stations that get more personalized the more you listen. Nice that it’s free, though. Siri: Still a work in progress, but definitely progressing. 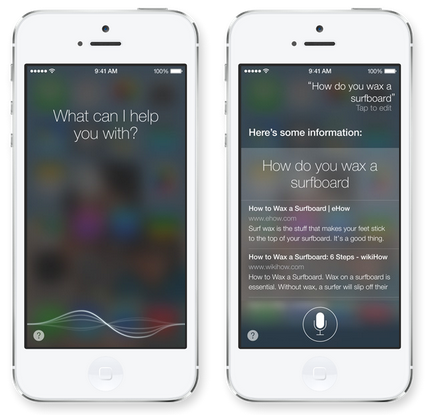 Siri has a new flat look and can speak to you in either a male or female voice. It is faster, and checks more sources. Unfortunately, it will be defaulting to Bing for web search rather than Google, which I think is a step down. It will perform more tasks now, like returning calls, playing voicemail, controlling iTunes Radio, and more. App Store: Some minor tweaks with a new “Apps Near Me” category that offers suggestions on apps that are popular in and around your locale. A good add for parents is a new Kids section that offers suggestions based on age. And, as noted above, apps will now update in the background, which is a welcome change. Find My Phone: It’s gotten a little better. Your Apple ID and Password need to be inputted to actually turn off Find My iPhone or erase the device. Good luck with that, phone thieves. Find My iPhone can also continue to display a custom message, even after the device is erased. Also, your Apple ID and password are required before anyone can reactivate it, so it becomes quite onerous to do nefarious things with someone else’s device. What about iPhones for business users? Along with some of the obvious usability improvements (business users love those), AirDrop and stronger phone security, some other commenters have noted certain features on the SDK slides that might be interesting to the enterprise. Enterprise Single Sign-on This allows users to authenticate once to the enterprise, and then get access to apps without having to repeatedly log in. Reduced log ins is a good thing. Per-app VPN – Virtual Private Networks are necessary for mobile/remote users, possibly allowing better user experience and ease network burdens. App Configuration Management presumably, mobile app management, perhaps offering the ability to push apps to or remove apps from managed devices. Maybe even prevent loading unauthorized apps. App Store Volume Purchase possibly an improved volume purchasing program, which would benefit larger businesses and educational clients. Smart Mailboxes likely similar to smart mailbox feature in OS X’s Mail app. They act as permanent email searches, which makes it easier to find emails matching certain characteristics. Better search means more efficient communication. PDF Annotations I love this one! No more opening your PDFs in a particular app to annotate them? Sign me up! Wi-Fi Hot Spot 2.0 Likely better mobile hotspot/tethering. Phone, FaceTime, and Messages Blocking Believe this to be blocking of communication based on phone number, email, or other factors. Sort of like the next generation of Do Not Disturb. Peer-to-peer Connectivity probably involves the new AirDrop feature. Data Protection By Default better security for apps. Possibly part of the data encryption that is already in place. And probably involves that encryption that will accompany AirDrop sharing. I haven’t identified all the changes with iOS 7 and there could be additional features added (or subtracted) before it all rolls out in the fall. Nonetheless, there is a lot here to sink your teeth (or your fingers) into so kudos to Apple for coming to the party with something to offer. I just got a new work smartphone – its Android-powered, but more on that later. With a quick download of a Nitro app, I have sufficient security to access my Outlook mail, contacts, calendar and tasks. I understand my IT department is deploying tools to further integrate the mobile and desktop experience – first, iOS and Blackberry, with Android-friendly tools coming soon. When I come into work these days, a new wireless network pops up on my phone’s screen: iPad Test. Yes, Virginia, businesses are definitely going MOBILE. Too Much of a Good Thing? You Bet! File this one under “Study Results that State The Obvious.” Nathan Eddy at eWeek reports on a survey of Facebook users showing that people who tend to overuse the site are more likely to be unfriended. More than 1,500 people were polled, albeit a very small percentage of the over 500 million members. The primary reason for unfriending? Frequent, unimportant posts. Posting about polarizing topics and crude or racists comments were the second and third most cited reasons. The study comes from University of Colorado PhD student, Christopher Sibona. Weeks reports that Sibona and others believe the results will have far-reaching implications for businesses on Facebook. On one hand, I am not so sure. With the separation of business pages from personal pages, one can make an effective marketing use of Facebook without annoying friends and family. I also wonder whether the study examined “unfriending” behavior distinguished from “muting” behavior – Facebook users have the option of muting posts by friends who annoy without having to go to the Draconian level of unfriending. On the other hand, I myself have unfriended voracious marketers who overstep the bounds of Facebook “friendship” and muted voracious posters who clutter the newsfeed. There is little question in my mind that sites like Facebook and Twitter can be overused and abused. While there is room in these social nets for originality, creativity and connection, the overmarketing employed by some users in this relatively novel stream of commerce will turn off other residents. And while Facebook “unfriending” is certainly easy to do, unfollowing on Twitter is even easier. Your message is lost if there is no one there to hear it. I believe it pays to remember that the old rules of advertising and marketing do not apply in the social media sphere – people are attracted to those who actually offer, rather than promise to offer, something of value. Part of the value equation is knowing when to speak and knowing when to listen. Think before you post. With every post I make, I try to consider whether it might educate, assist, entertain or support someone else. Leave the intercom on and running your self-serving message at your own peril. Way back, almost a year ago, I posted about a paper presented by Marcus Zillman on deep web research. Deep web research involves getting below the surface layer of web pages to documents stored on-line with extensions such as .pdf, .doc, .xls, ppt, .ps. and other more esoteric extensions. These extensions and this type of searching are particularly applicable to business research, as companies tend to store their information in this manner. 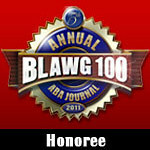 Mr. Zillman has done it again – check out his list of deep web resources for 2010 published on LLRX.com. His comprehensive list includes articles with background information, tools, resources on the semantic web, presentations, pertinent blogs and lots of other great links. You don’t have to “dig deep” to find what you might be looking for with Mr. Zillman’s help! I stumbled on yet another article examining the exploding growth of business promotion on Twitter and Facebook. Computerworld reports the numbers here and they are significant. The report can be found here. Over the past six months, there has been a 250% increase in promotional Twitter use and a 192% increase in promotional Facebook use. The Computerworld article focuses less on these staggering numbers and more on the security risks posed by such use of the social networking sites while on the job. I think they miss the point. Instead of focusing on the 1.5% decrease in employee productivity measured in the study, the researchers should consider the percentage increase in business development, marketing results, networking and goodwill generation. If you can’t beat ’em, consider joining ’em. Exciting news for business voyeurs: a new startup has just launched a service with access to a sizeable structured database of all things (public) financial. It is called Tracked and allows you to search for all sorts of business-related information on people and companies. Data includes company financial statements, compensation data, insider trading by executives, overiews and news items for people and businesses, etc. You can set up lists to watch for information about particular people, companies or industries. In other words, your own, customized Wall Street Journal. Profiles are organized, much like LinkedIn, but the depth of financial information is far greater. Techcrunch likens the new service to a cross between LinkedIn and Yahoo Finance. If only it could include the real-time aspects of Skygrid, Tracked could easily become “must see TV” for the financially-interested. It’s iPhone week this week. When isn’t it iPhone week? With new apps popping up hourly, there is always something new to try out. Today’s offering is from McGraw-Hill Professional. MHP is offering access to its collection of business-focused ebooks through a dedicated ebook reader developed in partnership with ScrollMotion. Topics include career development, management, innovation, entrepreneurship, communication, finance, investing, and more. The first group of available titles includes two recent best-sellers, How to Make Money in Stocks by William J. O’Neil and Leadership in the Era of Economic Uncertainty by Ram Charan. MHP plans to make more than 600 titles available before the end of 2009 and to expand into other professional areas. That’s right, Phil. Hit ’em where the live (and work). MGP’s ebook site is here. App press release can be found here.